The anchor is robust and heavy. The rotating eye is a good idea and you will need it to be this size to get any decent sold secure rated chain through it. I put mine in my garage floor by marking a square big enough to set the anchor in and get my hand round it, repeatedly drilling through 4 inches of concrete and using a bolster/lump hammer. Once I got through concrete I dug down about 10 inches and slightly outwards from the square hole, kind of onion shaped. I then set the anchor in 1.5 bags of postfix concrete forcing the dry concrete into all the space then pouring water in steps. I got the anchor plate level with my floor so the eye sticks up. Perfect. It isn't moving anywhere. I then sprayed my concrete black as I had boarded my garage and laid a vinyl floor down due to deterioration of the concrete. Probably one of the best anchors for the money. As deterrents go, this bad boy is certainly all that. Once concreted in, it would take an extremely determined thief to do anything but give up on it and try their luck elsewhere. With an equally sturdy chain, it should do the trick. Time will tell! Let's be honest, stopping a determined thief is probably impossible, but we try to make the process so noisy and time consuming that the thief decides to leave your bike alone and go else where. I see this device as part of a package of deterrence. When viewing the web pictures of the ground anchor it was difficult to gain a sense of proportion. Once removed from the box it became clear that this is a large solid bit of kit. I can't comment on the type and strength of the metal used, but it would clearly take quite a beating before it gave up. The other thing that became apparent was that the hole, through which your security chain is looped, is big enough to take the biggest chains currently on the market. Digging this anchor out of the floor would clearly take time and make a lot of noise - something that the thieving bilge rats don't like to do!.. Coming from a security back-ground, I would suggest placing it up against another solid object, like a concrete post or the wall of the garage/room where the bike is stored. This makes it very difficult to get a sledge hammer to it, or cutting gear around it. Overall I was impressed by the construction of this and feel confident that removing my bike from my garage would be a lot more difficult. Very impressed. Great anchor, feel much better about the bike now. Feel like the weakest link is the chain now, and not the anchor. This is a beast it's really well made and tough. It ticks all the right box's. I sunk this is a taper hole wider at the bottom than the top. And pushed it into fast setting concrete. Now my bike is super secure. Buy with confidence and beef up your security. Bought this ground anchor for the occasions my bike is left out to save constantly putting away in the garage. Certainly looks the part and would certainly not be easily removed. Will give me more peace of mind for sure that an opportunist thief may look elsewhere. I have just installed 5 anchors besides my self catering properties. Tips are to dig hole. Open post mortar mix (I used two), mix with water, mix with a shovel , set anchor and make certain that the post is filled on the inside. I had a load of stones nearby which I incorporated to make it headier. As my holes were dug with an excavator I used two bags of cement to every anchor. Sportsbikeshop delivered swiftly and love the swiveling action of the head. The anchors are solid and well made. If you want to try before you buy why not rent a self catering stay at www.thelittlehouses.co.uk and request either a two bedroom or four bedroom lodge. Thanks for reading the review. Great product. Easy to install. Looks good. Solid. 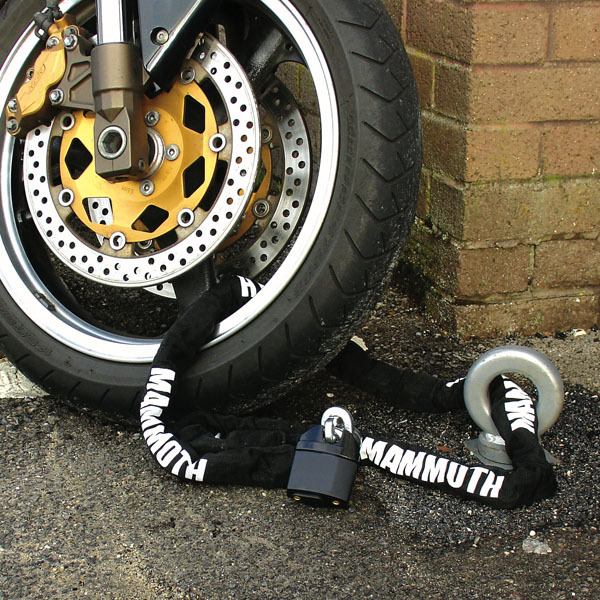 Mammoth and Thatcham rated security, utilising the best materials and components available, the Mammoth range provides security solutions for all motorcycle and scooter needs. 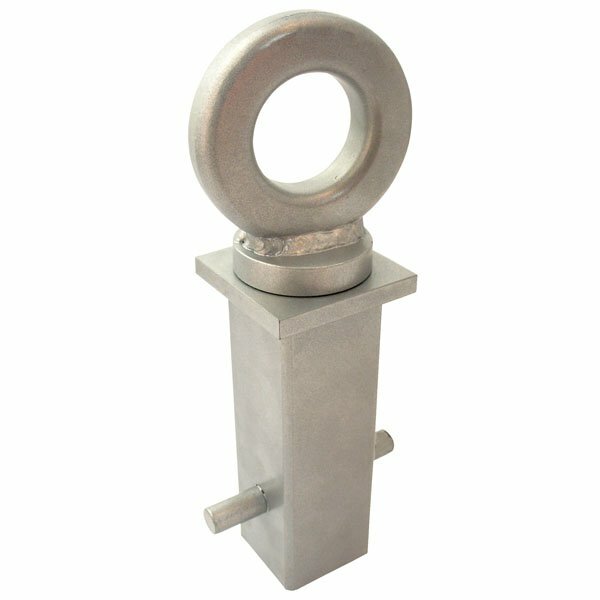 Unfortunately the Mammoth Security Concrete-In Ground Anchor is not listed as Sold Secure. Unfortunately the Mammoth Security Concrete-In Ground Anchor is not Thatcham approved.